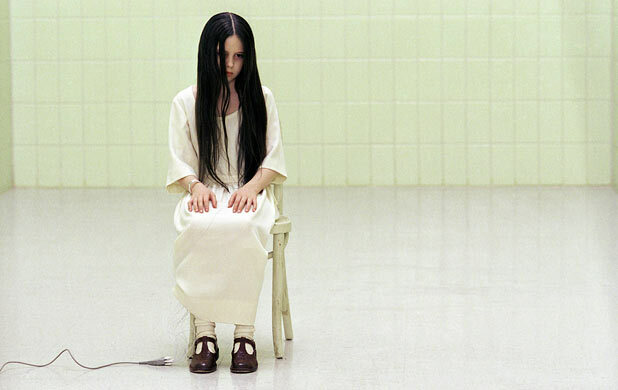 The Rockport Film Review: Before You Die You Must See "The Ring"
Before You Die You Must See "The Ring"
Based on the Japanese horror sensation "Ringu" the American remake "The Ring" launched the J-horror craze in the fall of 2002. Ever since several Japanese and Asian film have had remakes but none have had the power and success of "The Ring"
Set in the wet and ominously gloomy city of Seattle single mother Rachel, played by Naomi Watts, works as a journalist who comes across the mysterious story of a video tape that has deadly consequences 7 days after watching it. Her son Aidan is a strangely mature and articulate little boy who seems deeply troubled but he is just another part in the thoroughly creepy and inventive story. The opening scene of two teen girls talking about the tape has been spoofed many times but effectively sets up the urban mythology of the killer tape and gets Rachel involved as the victim was a relative and one of Aidan's closest friends. When Rachel starts to investigate she finds out that a bunch of teens that stayed in a cabin at some resort all watched the cursed video have all recently died. So what would be the logical thing to do? Watch the video of course. Rachel drives to the resort and stays at the same cabin, number 12, she views the short black and white video of bizarre images and immediately afterwards the phone rings. When she picks it up a voice echoes 7 days and the countdown begins. She enlists the help of ex-flame and current co-worker Noah to help her find out the origins of the tape. The technology portrayed in the movie is in that period where everybody still had the big tube television and VCR's were still hanging by a thread. Those two things made all the difference in making it as creepy and scary as it is. HDTV's and DVD's are just too cold and clinical. The old technology has a worn in grungy feeling that is indispensable. But also in a strange way the movie invented the term viral video. Their research has lead Rachel to a horse farm on a remote island where what's left of the Morgan The old patriarch Richard Morgan lives there alone with nothing to do but work the land. His wife Anna had committed suicide years earlier. But wait there's more, desperate for a child the Morgan's adopted a daughter named Samara. Now this is a creepy kid and the key to the cursed video. We learn the disturbing back story of Samara and the Morgan's and its Rachel's job to set things right and stop the curse. Then comes the clever twist that sets this movie apart and brings us the movies signature moment. Almost three years later we were given a lame duck sequel directed by the guy to did the original Japanese version. Needless to say the original stands alone as an entertaining and frightening experience.